Much like an airplane, all children react differently to boat rides. Instead of rushing to feed everyone before the trip, arrange for your departure to be earlier in the day and plan breakfast on the boat. Located in the San Pedro and Long Beach terminals, The Catalina Bistro serves up fresh fruit, muffins baked in-house, as well as made to order hot breakfast options. Let them fill their bellies and they might even catch a few more ZZZ’s before arriving in Avalon. On the ride over, it is common to see some marine life like dolphins or whales. Try to sit your group next to the windows to keep look out for these fishy locals. Sitting for an hour isn’t easy for them, so stop at the pirate ship themed park right off the terminal in Avalon to let the wiggles out. There are so many options when considering an overnight trip to Catalina Island and all hotels offer different advantages. La Paloma and El Terado Terrace have rooms that include kitchenettes for those late night bottle feeding. If you would like a more home-like feel, Hotel Catalina Courtyard & Garden Suites offers multi-room cottages. Avalon is only about 1.5 square miles, most of which can be traveled to on foot. If little legs need an extra help navigating the colorful island, rent a golf cart. Golf carts are the primary source of transportation other than biking or walking. A golf cart is treated like a car, so all children must ride in a car seat if they are under the age of six or under 60lbs. Most golf cart rentals will have car seats to use, but it is wise to confirm before booking. Catalina Island is full of high flying or rugged adventures some of which may be out of reach for little ones, however, there are many things that are open to all ages. A favorite must-do on everyone’s list is the glass bottom boat tour. This open-air boat is lined with clear windows on the bottom of the boat to see our fishy friends below. Everyone will enjoy spotting the famous, bright orange Garibaldi, Kelp Bass, and others along the protected coves. Don’t forget to purchase fish food from one of the local shops on Green Pleasure Pier so you can feed the fish from special holes near the windows. Have some family bonding time by sinking a few hole-in-ones at Avalon’s mini-golf course. You will make unforgettable memories on the unique 18-hole course that has been a much-loved fixture on the island for nearly 40 years. What better way to make memories than to experience an outback journey on the Safari Island Adventure tour? This open-air safari vehicle takes you and your family through the canyons of the Island Conservancy, home to wild animals like buffalo, Channel Island Fox and bald eagles. Descanso Beach also offers the best beach experience in town. With its soft sand beach and an excellent lunch that can be served directly to your towel, you will be able to spend as much time as possible with your minnow. Lugging around diapers, formula, and jars of baby food can get heavy. Have no fear, Avalon does have corner marts and Vons Grocer. If you are in need of anything else for your trip like pack-in-plays or strollers, ask your hotel clerk about rentals. 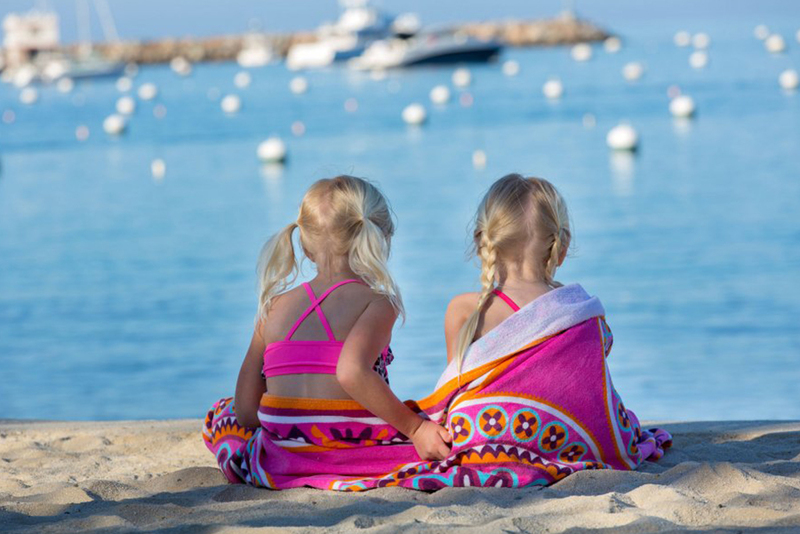 Master your one of a kind family trip to Catalina Island while making life long memories. Start planning your adventure today.